Nestling between Tibet and India it is a country of raw natural beauty; from stunning mountain scenery to tropical plains. This pristine scenery is home to exotic wildlife and is one of the last refuges of species like the Black-Necked Crane, the Golden Langur and even the Royal Bengal tiger. The Bhutanese people with their Buddhist beliefs have a strong sense of identity and of the interdependence between man and nature. This is expressed in the national policy of Gross National Happiness and concern for the environment. The Thunder Dragon Marathon highlights all of the aspects of Bhutan that make it so special. Running through the beautiful Paro Valley the route takes in fantastic scenery and passes many iconic landmark like the Tiger's Nest, Monastery, Paro Dzong and many religious Chorten. A true mountain and cultural experience. 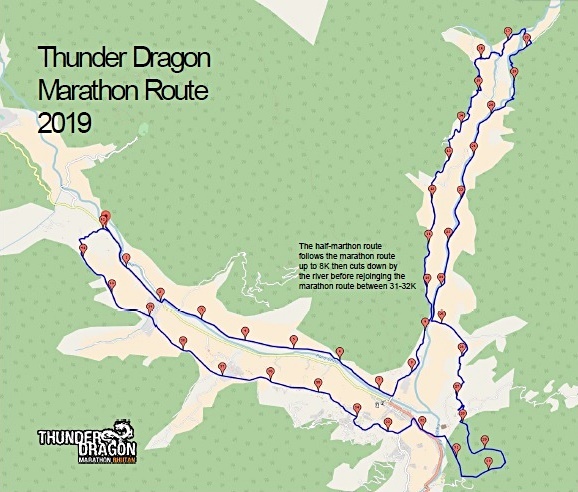 The Thunder Dragon Marathon is run half and half on trails/mountain paths and the road. The route has a number of climbs but with an altitude variation that stays between 2,200m and 2,560m there are no tremendously difficult sections although it remains a suitable challenge. The Thunder Dragon Marathon is a fully hosted tour. The race starts at Udumwara, underneath the cliff that the Tiger's Nest is built on. The route is approximately half road surface and half farm trails; on the marathon course there is a 4km section of single track. The first 8km is on the road and slightly downhill, alongside the Paro Chu (river). At 8km the half marathon splits off to the right and makes its way up and behind Paro Dzong (fort). The marathon continues straight on with a long and gradual climb alongside the Wang Chu, on farm tracks above rice fields. At 18km the marathon crossed the river and returns towards Paro on the other side with a gentle downhill gradient to 25km. Here the route has the toughest climb, about 4km on the road, rising above the Paro Museum then on a single track for 1km to the highest point of the race (2,560m). Dropping back down to the Paro Chu, the marathon and half marathon re-join beneath Paro Dzong to cross the famous wooden bridge. The last 10km for both distances is on a gradual but long uphill climb on a mix of road and wide farm track, rising above Paro Chu, with views of the river and rice fields, before dropping into the finish at Udumwara. The total height gain on the marathon is 995m and 450m for the half marathon. The altitude at the start is 2,400m and the lowest point, in Paro, is 2,200. The route is a mixture of gravel road, farm fields and mountain tracks with a few sections of tarmac road through Paro town. Trail running shoes are recommended. Drink stations will have bottled mineral water, bananas and rice every 5km. If you require gels or electrolytes we recommend you take them with you. The event will be fully supported by local guides and horses, water stations plus medical back up from doctors and local first aiders (there is a modern hospital 500m from the start/finish line in case of emergency). There are evacuation points on the mountain in case of emergency accessed by 4-wheel drive to nearby roads and mobile phones have connectivity on the full route making communication easy. May is the end of the festival season and marks the change from Spring to Summer. There are two main seasons for visiting Bhutan. The first is in the Spring (March to May). This is the season for wonderful flowers and birds, the days are warm and the mountain peaks are still visible for much of the time. Daytime temperatures in the main centres you are likely to be visiting are around 17 to 22 degrees Celsius, increasing through the season and by May evening temperatures are very pleasantly warm as well. Visas are issued by the incoming tour company in Bhutan and we will take care of this process for you. The cost of your visa is included in the package. Visas are issued 2-3 weeks before travel. Visas are issued as a group and all runners arriving on the same date will be listed on the visa sent to each traveller. The mystical Kingdom of Bhutan is located in the eastern Himalayas bordering India and Tibet. The local name of Druk Yul means ‘Land of the Thunder Dragon’, which, perhaps, frames the way we think of this magical Buddhist country. The size of Switzerland but with a population of only 700,000 living in mostly rural communities farming rice on the lower levels and herding yak as the altitude climbs, Bhutan remains a Kingdom steeped in history, mysticism and tradition. The comparison with Switzerland is not just in size. Unlike many Himalayan areas the Kingdom has protected the mountains from deforestation and tourist exploitation leaving the countryside pristine. Tourism is controlled and you must be on an organised itinerary booked with a local travel agent to get permission to enter Bhutan – you cannot enter and wander around unguided or back pack through the country. We are pleased to offer a range of options that allow runners to acclimatise to the altitude, with long and short trips to suit your sense of adventure and the time you have available. The treks are fantastic with magnificent views of the high Himalayas and are moderate in difficulty, reaching altitudes of 4,000 to 4,200m, or enjoy a cultural west-to-east tour by private minibus after the marathon to experience the differences across Bhutan. For those on a short time scale the 4-night tour offers enough time to acclimatise and see some of the area including the walk up to the incredible Tigers Nest Monastery and a visit to the capital Thimphu. Runners on the same itinerary will stay together at the one hotel. Hotels are 3 to 4-star standard and typically have rooms of a good size with ensuite bathrooms, cable TVs and toiletries. This this is a fully hosted tour. Accommodation is on a full board basis with breakfast and dinner at the hotel and lunch at a local restaurant. Great Wall and Himalayan Kingdom Marathon Double! For an extraordinary trip, it is possible to double up on your Great Wall Marathon experience with the Thunder Dragon trip for the ultimate cultural experience. Leaving Beijing behind on the Monday, fly to Bangkok (not included) and overnight at an airport hotel (not included) before taking the included flight to Paro. Contact us for details. Arrivals from Delhi, Singapore and Bangkok also available at a supplement. Hike to Taktshang Monastery (Tigers Nest) 6hrs. On the way back visit Kichu Lhakhang. Excursion to the Capital City Thimphu (1½ hr journey by coach, each way). Visit the painting school, folk heritage museum, textile museum, Budda Point, Takin Reserve. Afternoon visit to craft bazaar and weekend market. Race day! Marathon and Half Marathon. Celebration Dinner and Cultural show. Fly out to Kathmandu, Delhi, Singapore or Bangkok. Note: flights from Kathmandu, Bangkok, Singapore and Delhi depart early in the morning to Paro and we strongly recommend you book overnight accommodation before your flight. A tour that captures the variety and culture of Bhutan. The Paro Valley with its surrounding pine clad mountainsides; Thimphu, the capital city of Bhutan; and the Punakha Valley, a lower lying valley which gives a semi-tropical climate. This tour can be combined with the Great Wall Marathon by adding flights from Beijing to Bangkok with an overnight before your early morning flight to Paro. Drive to Punakha via Dochu La Pass (approx. 2½ hrs). Afternoon sightseeing in Punakha; visit the Divine Mad Monks Temple (Temple of Fertility) and the remarkable Punakha Dzong, past home to the King of Bhutan. Today we start our acclimatisation with a hike to Soela Gompa via Khamsum Yuelley Namgyel Chorten. The hike is approximately 15km at moderate difficulty with the first 5km possibly being difficult for some. The hike takes around 8hrs. Options to return after visiting the Chorten for a shorter hike can be arranged. Drive to the capital, Thimphu (2½ hrs). Hike up to Buddha Point and the giant seated Buddha, the Takin Reserve (national animal), Thimphu Dzong and craft workshops. After lunch, drive to Paro (1hr) visiting the National Museum with the chance to hike part of the marathon route before visiting Paro Dzong. Hike to Taktsang Monastery (Tigers Nest - 6hrs). On the return, visit Kichu Lhakhang Monastery. Free time for shopping in Paro. Early breakfast before the 8am start of both races. Celebration Dinner and Cultural show at Olanthang Hotel. Bhutan has some of the best trekking in the World and as part of our 9d pacakge we offer a fully supported 4-day trek on the famous Druk (or Thunder Dragon) Trail. With much of the hike up and around 4,000m, this will also help you acclimatise for the race (which has an average altitude of 2,300m). The 9d itinerary also takes in a visit to the famous Tigers Nest and an overnight stopover in the capital Thimphu. Hike to Taktshang Monastery (Tigers Nest) 6hrs. On the way back visit Kichu Lhakhang. Druk Path trek – Day 1. Climb gradually upwards from the Paro Valley to the camp at 3650m. Most of the altitude gain is done today through Forest. 20km. Climb is moderate to hard. On leaving the camp we climb fairly steeply for 1hr then follow a ridge with views of Mt Jomolhari. A steep descent takes you to the campsite next to a beautiful lake. 15km. Today is a tough day of ascents and descents up to 4150m. 11km. The day begins with a gradual climb with views of Mt Gangkhar Puensum, Bhutan’s highest mountain, before dropping into Thimphu on a steep descent. Visit the Takin Reserve, which is close to the finish point of the trek. In Thimphu. Visit the painting school, folk heritage museum, textile museum, Budda Point, Takin Reserve. Entry is available only in conjunction with a travel package from RunFun Travel. Your visa for Bhutan will be arranged on a group basis and is included in the tour cost. You should check the visa details of any other country you are visiting or transiting through on the way to Bhutan. Guides for each tour option throughout the tour from arrival to departure. A non-refundable payment of $600 is required to secure your Thunder Dragon Marathon travel, entry and accommodation package.